As you know - I love Target! I could easily spend $$$ left alone for a few hours in there! Target recently started carrying the new Pacifica skin care and and makeup line along with a few of their body lotions. So you know I had to buy a few things. 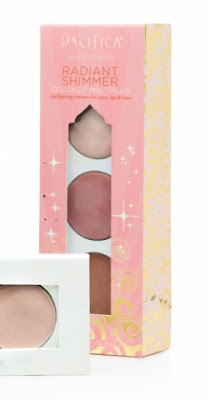 The Radiant Shimmer collection is really pretty, it is has multiple uses but I like using it on my cheeks for a dewy glow. I like the lighter color as a highlighter on the tops of my cheekbones and the two other colors as blush. It blends very well, has a faint tropical scent and is not greasy. 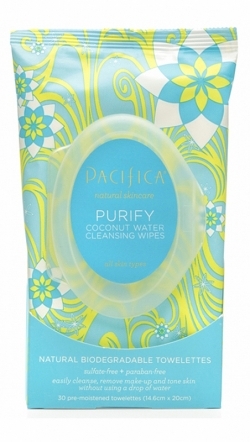 I bought the Purify Coconut Water Cleansing Wipes for our gym bag, I was hesitant to pass one to Matt because of his dislike of coconut. However he likes the smell! It is light, fruity and reminiscent of a tropical drink. They refresh without being to soapy. They leave a light sent behind along with a refreshed feeling. Even though they are scented my sensitive skin does not freak out or turn blotchy. I will be buying a few more things shortly! I am hoping they are just as good as these two products! I love coconut! I might have to try these. Thanks for the tips. I, too, love Target!